I grew up with the false notion that the Great War was fought exclusively on the western and eastern fronts of Central Europe. This was, of course, far from the reality. The conflict was fought in the colonies and on the seas over the entire planet. In some places there wasn’t any conflict as in German Samoa where New Zealand Expeditionary Force troops peacefully landed on undefended beaches, bloodlessly taking control and staking a flag firmly into the soft white sand. The various colonial strongholds of Africa saw particularly fierce fighting as land grabs took place in the initial stages of the conflict. Locals were quickly press ganged into uniform, handed rusty weapons and given rudimentary instructions on the art of modern warfare. After the initial flurries of activity things did calm down. An uneasy stalemate of sorts descended on the contested areas. Eventually the best of the indigenous troops were shipped off to fight alongside their colonial masters in the trenches of the western front. They quickly garnered the respect of the entrenched troops. They fought with great distinction. Battalions of Moroccans, Tunisians, Cameroonians, Senegalese and Algerians fought alongside the French poilus. Indian Sikh forces struck fear into their enemies as they advanced with their sharpened Talwars glinting in the early morning sun. There are a few great films that portray these slow moving backwaters of the Great War. Off the top of my head Lawrence of Arabia (1962) and African Queen (1951), both of which will be reviewed sooner or later. But, my film today is not one of those films. 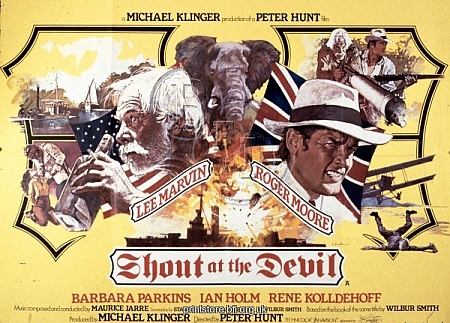 Ladies and gentlemen, for what it’s worth, I give you ‘Shout at the Devil’ (1976). 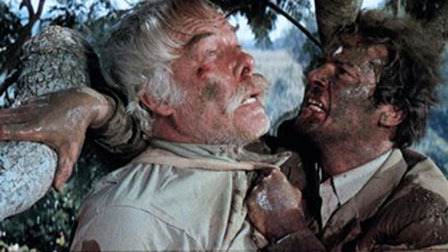 Here’s the quick version of my review… Roger Moore and Lee Marvin in a slapstick romp, fighting goose stepping and moustachioed Germans through the jungle and plains of German East Africa. Yep that’s it. One big, fat, unfunny stereotype. Roger Moore plays the stereotypical quintessential English aristocratic yahoo alongside Lee Marvin’s stereotypical drunk, expat, loud mouth, American misogynist. The first problem I have with this film is that Roger Moore is playing a young romantic lead when he was (and I did the maths) about 50. That on its own isn’t a killer blow but when packeted with Lee Marvin gurning and overacting from start to finish I start to lose interest. 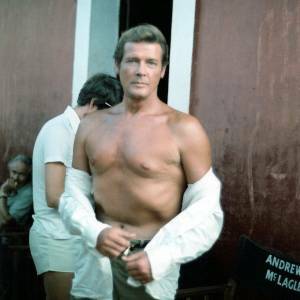 The cliched characters have no depth whatsoever, Roger Moore is always wooden at best but seems to have discovered some way of removing even more character from his character than usual. The eyebrow rarely raises. Lee Marvin is a bit better. I think the problem with him is that time and comedy sensibilities have changed to the point that 70’s gooning and gurning are no longer in any way funny or entertaining. The book the film is based on is apparently a blood bath. I can’t comment on how well that’s handled in the book but in the film I have plenty to say. The deaths on screen just seem pointless and quickly forgotten. Moores’ daughter is killed in an attack by German colonial soldiers giving us some plot for the second half of the film. Vengeance will be had. Even this isn’t handled particularly well. Moore can take some of the blame but the script isn’t loaded with opportunities for him to show off his vengeful parent chops. I can’t honestly be bothered to write any more. Maybe I dislike this film because it doesn’t take the subject matter seriously, but even if I shut one eye and view it as simply as possible, as a 70’s comedy, it’s just not funny. So in conclusion, bad actors over and under act through a poorly scripted and ill-conceived comedy about people getting killed and badly hurt. I’ll leave it there. Goodnight. here. We get a wee kick back from Amazon so thanks for your support. Next up, the excellent J’accuse (1919). Love Interest is NOT killed off half way through in fact not killed off at all. It was the lovely Barbara Parkins, and she and Roger are together at the end. You’re right. I do by know why I said that. Edit pending. Have you ever sen The Blue MAx, I notice not on your list?